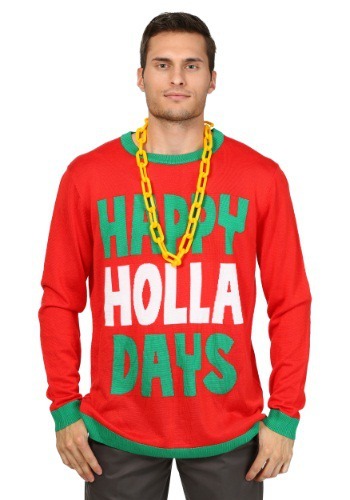 Lightweight knit sweater w/ funny saying, "Happy Holla Days"
Sometimes, the holiday season can be kind of rough. Yule has a way of working its charms in mysterious ways, and sometimes those ways are downright lame. But not for you! Never. Christmas-time is YOUR time to shine like a ridiculously polished gold chain. While family and friends may, at times, feel stressed out or downright down come December, you never lose your faith in the Christmas spirit. 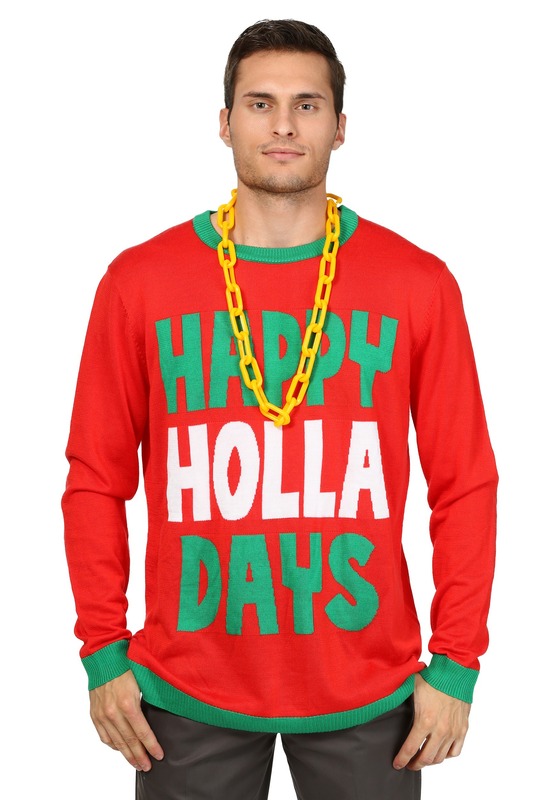 And we would like to reward your persistent positivity with this Happy Holla Days Christmas Sweater, so you never forget the true reasons for the festive season! Christmas, after all, is the ideal time for you to “holla” at your family, at your friends, or at that special someone you've had your eye on--telling them you appreciate them beyond words (unless those words are emblazoned on a sweater, like these). It is the time to share love and bling with strangers and sweeties alike! It is the time to let the world know that you ain't no bah-humbugging bro. So, congrats on your contagious Christmas cheer, champ! We know your loved ones appreciate it, especially since this year, it comes with a cleverly worn pun. As if that wasn’t enough to make everyone feel like their stockings were full and their goblets runneth over, this look comes with a large, yellow chain necklace. So go ahead, friend, deck the halls with boughs of “holla,” because this season is all about good cheer, whatever that means to you.